“So is this really not a bar? I really thought it was,” says a perplexed man sporting salt-and-pepper hair and a faded maroon shirt. He was walking around the neighborhood with his wife and young child, who sat patiently in the stroller as he made his inquiry. It’s not hard to see why the man was confused as he walked by the Republic of Booza, a bright new storefront on a quiet corner in Brooklyn’s Williamsburg neighborhood. While the shop does not sell any booze, it does sell booza, an ice cream style born in the Levant. What sets booza apart from other ice cream styles -- besides its playful name -- is the fact that it is stretchy. Like, pulling on a rubber band or a mozzarella-stick-fresh-from-the-fryer stretchy. If yoga was a dessert, booza would be it. For the most part, booza is made with standard ice cream ingredients like milk, cream, and various flavorings, though it does not contain any egg. The base does get mixed with salep and mastic, however. “Salep is a flour traditionally made from orchid root, and mastic is a resin that comes from the mastic tree in Greece,” explains Michael Sadler, one of the co-orders of Republic of Booza. These are the two ingredients that give booza its signature stretch. It similar to dondurma, a style of ice cream from Turkey that is equally as stretchy. Sadler believes that booza is the ideal and ultimate form of ice cream. “Booza quite literally packs more flavor per scoop.” It is less airy than most ice creams, resulting in a dense and compact product. It’s even denser than gelato -- frequently the gold standard for those in search of thicker, more flavor-packed ice creams. Sadler adds that booza is also more supple than gelato, a description that might surprise many. While booza is stretchy, it’s texture is not rubbery or chewy, but instead it is intensely creamy. Most importantly, thanks to the salep and mastic, booza melts more slowly than other ice creams, making it perfect for long, hot days with unrelenting sunshine. America really is the land of opportunity -- at least when it comes to ice cream consumption. Name a style or flavor and you’re likely to find it somewhere across the 50 states. Piles of frozen soft custard? Check. Dense and svelte cones of gelato? Check. Perfect spirals of rolled ice cream? We have that too. Indian kulfi? Also easy to find. So are airy matcha soft serve and mochi-encased ice cream. So why haven’t most Americans had booza before? There are a handful of makers around the country, but Sadler says that he and his three co-founders, are the first to set up a full-scale booza scoop shop outside of the Levant. Perhaps the reason for the lack of widespread booza is due to the difficulty of sourcing salep and mastic, ingredients that are not all that common in the West. Booza is also a little more finicky than standard ice creams, especially when it is made without chemical additives. “Most ice cream that people eat have additives in them that allow them to be scooped at ultra low temperatures,” says Sadler, a former academic. Booza, on the other hand, is ideally served between 12 and 15 degrees Fahrenheit. which is about 20 degrees warmer than most ice creams. This is because the booza needs to be agitated -- or pounded and stretched -- by hand before scooping to get the creamy, non-chewy texture everyone loves. Sadler and his team have grand plans for booza. “Our mission is for the world to fall in love with booza, like it did gelato, “ he says. 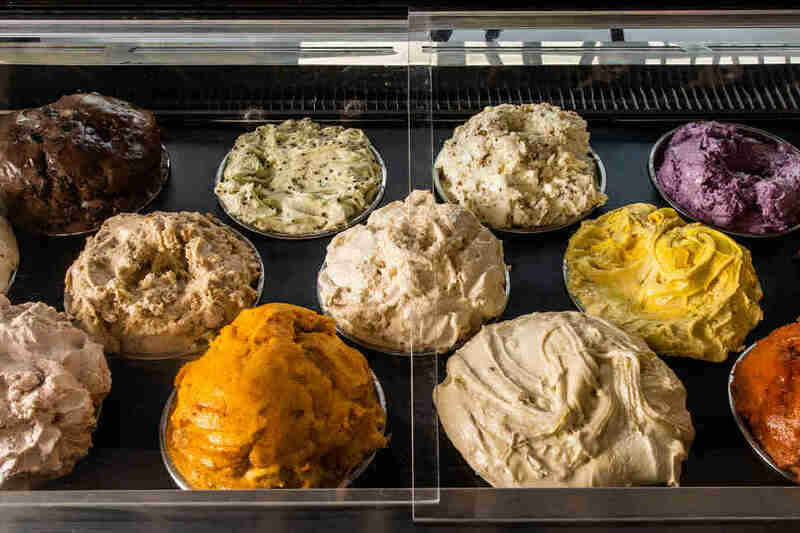 “We’d love to see booza to become a household name alongside gelato and soft serve.” To do this, Republica of Booza is serving traditional flavors like kashta -- or a pure milk flavor -- and saffron, alongside more populist flavors likes Oreo and matcha. Sadler says the team is working on making pints of booza, too, so you can give your spoon a workout at home. 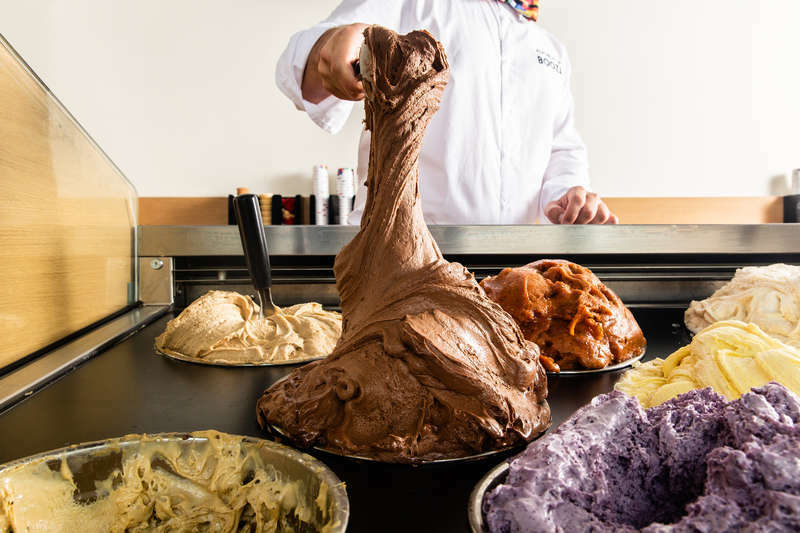 Republic of Booza hopes to expand its scoop shops too, though for now, they are focusing on just making sure they keep the weekend crowds -- which frequently wrap around the block -- well-fed and the ice cream well-stretched. 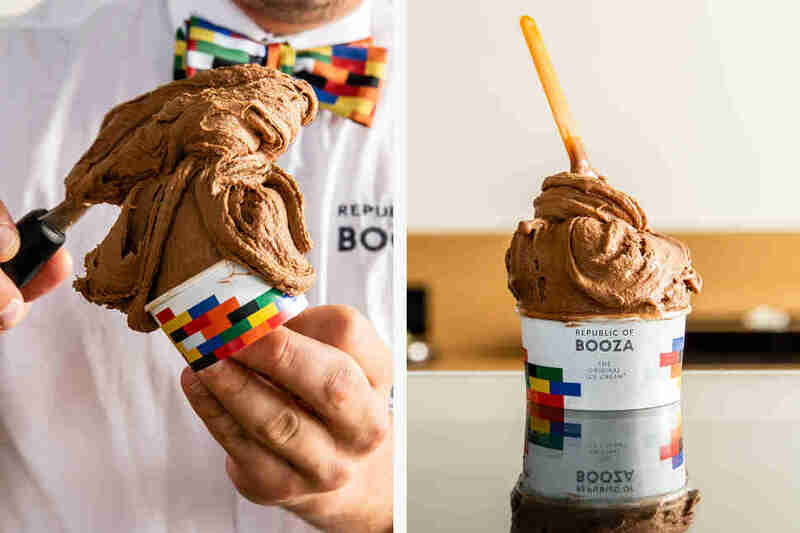 But give how naturally Instagrammable booza is -- the modern day marker of food success -- we wouldn’t be surprised if several more scoop shops pop up around the country overnight. Who knows, one might even sell boozy booza. Khushbu Shah is the senior food editor at Thrillist and prefers Booza over booze. Follow her on Twitter @khushandoj.